We all know LA traffic is a nightmare, but not only for humans. Our traffic is killing precious wildlife. Mountain lions living near Los Angeles are facing extinction and being killed attempting to cross the freeways. The National Park Service (NPS) reports that since 2002, they have studied over 60 mountain lions in the Santa Monica Mountains area and have found one main issue: their homes have been cut off. Busy Freeways and urban development throughout Los Angeles has created a population of lions with the lowest genetic diversity measured anywhere in the entire U.S. outside of Florida panthers. These roads have killed 17 lions since the study began. The only thing that can have these big cats is the ability to move between regions. 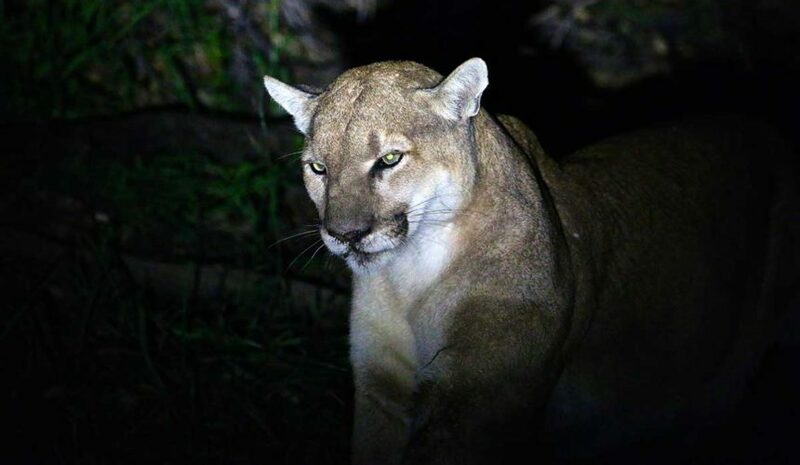 With multiple large freeways surronding the lions, the National Wildlife Federation partnered with the Santa Monica Mountains Fund and large community of supporters to create the #SaveLACougars campaign. This campaign focuses on building something really cool: a wildlife crossing over the 101 freeway at Liberty Canyon, for animals to use and safely cross above 10 lanes of LA traffic. With your help, we’re going to re-connect a precious ecosystem. It takes a village to save our local cougars—and to build potentially the largest wildlife crossing in the world! The wildlife crossing at Liberty Canyon is a public/private partnership. The core project team, which meets regularly to discuss the planning, design and engineering, along with the fundraising and educational activities, includes representatives from local, state, and national agencies and organizations—Caltrans, the National Park Service, the Santa Monica Mountains Conservatory, the Mountain Recreation and Conservation Authority, the Resource Conservation District of the Santa Monica Mountains, City of Agoura Hills, and the National Wildlife Federation—along with local and state elected officials. The #SaveLACougars campaign, dedicated to raising funds to support the effort, along with conducting the educational activities and public engagement around the project, was founded by a partnership of the National Wildlife Federation and the Santa Monica Mountains Fund. 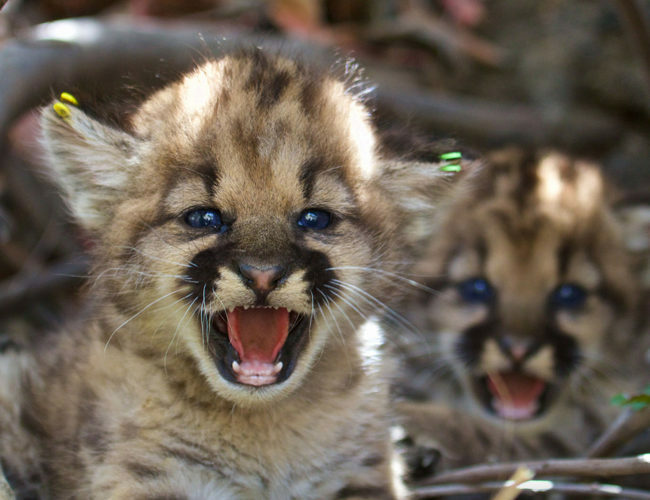 Bring the amazing story of P-22 and the mountain lions of Los Angeles to your school! Presentations are available for all age groups. Students will learn about the incredible journey of P-22, some of the National Park Service and other scientists studying these mountain lions, along with secrets and surprising facts about North America’s magnificent wild cat, now struggling to survive in our local mountains — and what we are doing to help. Beth Pratt, National Wildlife Federation’s California Regional Executive Director, leads the #SaveLACougars campaign, and has worked in environmental leadership roles for over twenty-five years, and in two of the country’s largest national parks: Yosemite and Yellowstone. From working with wolves to bears, she says “nothing has inspired me more than helping to build this landmark crossing outside of Los Angeles to help save this urban population of mountain lions”. She is also the author of the book, “When Mountain Lions Are Neighbors: People and Wildlife Working It Out in California” and featured the story of P-22 in her TEDx talk, “How a Lonely Cougar in Los Angeles Inspired the World”. Molly Judge, Director of Leadership Giving & Individual Philanthropy works closely with philanthropists and other donors who want to make sure cougars and other wildlife benefit from the wildlife crossing at Liberty Canyon. Molly has worked on successful capital campaigns and other major gift efforts for the last fifteen years. Previous projects include the renovated Zuckerberg San Francisco General Hospital and the expanded Ronald McDonald House at Stanford. Molly is also the mother of a young son, who joined (in utero) Beth and the rest of the #SaveLACougars crew on the first urban hike tracing P-22’s footsteps from the Santa Monica Mountains to Griffith Park. She and her family find time to enjoy wildlife and nature whenever possible. Amanda Leon, Regional Philanthropy Officer for California, enjoys strengthening the connection National Wildlife Federation members and philanthropists have to wildlife conservation projects throughout the state and the country. Born and raised in the Golden State, Amanda values the diversity of the population, landscapes and ecosystems that make California an exceptional place to bring people and perspectives together around saving and coexisting with wildlife – especially LA Cougars! Prior to joining the team, Amanda raised funds for student scholarships and services at Mihaylo College of Business and Economic at her alma mater, Cal State University, Fullerton. She enjoys hiking new trails and listening to live music in her free time. Amanda looks forward to hiking alongside Beth and other cougar fans at the next Urban Wildlife Week & P-22 Day. April Gilbert, Operations Coordinator and Executive Assistant for the California Region, provides administrative and operational support for the California Team and Regional Executive Director. She is completely charmed by the courageous and charismatic P-22 and particularly excited about the Wildlife Crossing at Liberty Canyon. Previously, April worked at the Leonardo DiCaprio Foundation as the assistant to the CEO and earned her Bachelor of Science in Sustainable Management from the University of Wisconsin, Stout. An avid backpacker, April believes the more we can connect with nature, the more we can connect with ourselves and each other. April is currently a student in the Conservatory at Second City, Hollywood. 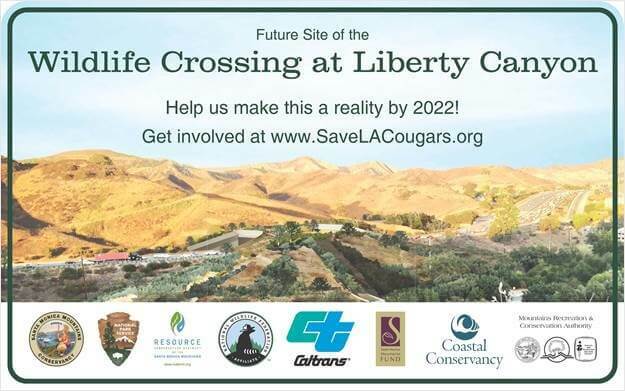 To learn more about the #SaveLACougars Campaign, download our Frequently Asked Questions.